Well, my last post only managed to get us up to around 1906, so we’ll have to hurry things up a bit. As mentioned before, Houdini was a big hit and a frequent performer in early 20th-century Detroit. 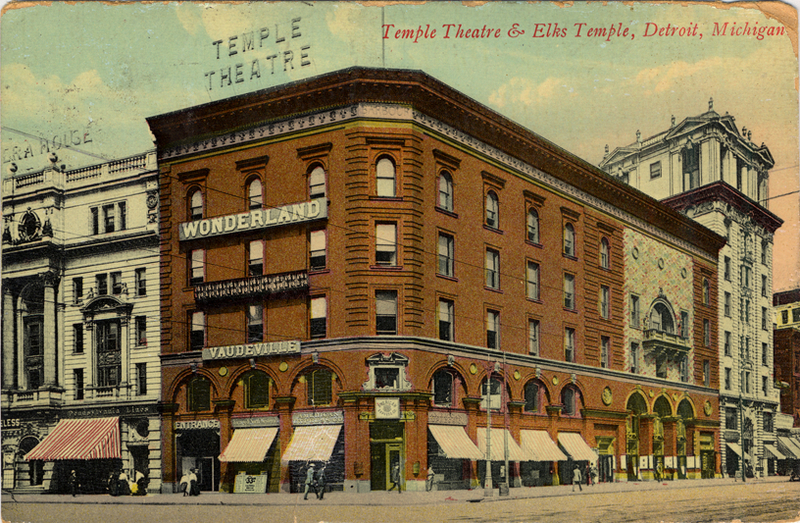 He most frequently played the Temple Theater on Monroe Street, owned by showman B.F. Keith. This is NOT the Masonic Temple, and the building unfortunately was demolished in 1928. Progress. Meanwhile, in between all of his performances, Houdini was ramping up his campaign to expose fraudulent mediums and bogus spiritualists. He took to the lecture circuit with gusto–and made a few frenemies along the way. One of these “friendly enemies,” as his wife Bess would later describe her, was Margery Crandon. An attractive, vivacious flapper, Crandon converted disbelievers by channeling the spirit of her dead brother Walter. Objects flew, tables rapped, and ectoplasm flowed from her nose and mouth…and from under her loose robes, in a titillating show. Once he figured out her tricks, Houdini went on to perform them in a comic takedown that made a mockery of her supposed channeling abilities. This made him pretty unpopular for a while, but history would vindicate Houdini. Houdini also ramped up his efforts to spread awareness of the skill and physical prowess required in his act. Beginning in 1924, the Detroit Free Press Sunday editions included a special “Red Magic” section edited by Houdini. The inserts “appeal to youg and old, abounding in baffling tricks, curious illusions, perplexing puzzles, interesting tests and the stock in trade of the world-famous magician.” By showing young readers exactly how he achieved his effects, Houdini hoped to protect the gullible from fraudsters with his own contortionist talents. The series continued until a couple of months after his death. By the way, remember that name: Thurston. It will be important later. Especially interesting to me is the portrait these combined activities of Houdini presents. We spend so much time imagining Houdini as the mystical, otherworldly stage magician. But history tends to focus less on the intelligent, keen investigator: Houdini managed to draw in large crowds with his dramatic stunts, all while openly explaining exactly how he managed to achieve the seemingly supernatural. He devoted at least as much time to exposing how the effects were achieved as he did to staging elaborate shows. Only a performer as dedicated, keen and committed to truth could pull this off. Houdini did, and that’s part of the allure for me. And now to the reason why you’re really reading this: we all know that Houdini died in Detroit on Halloween in 1926. A little bit of background is in order. The month leading up to his death, Houdini was as usual on a rigorous and demanding tour schedule. The 52-year old was still in top physical shape but in some pain, having broken his ankle a few days before in Atlanta during his Water-Torture Cell escape. Houdini also took the time nearly everywhere he went to give impromptu lectures at colleges, debunking common spiritualist hucksters’ tricks. 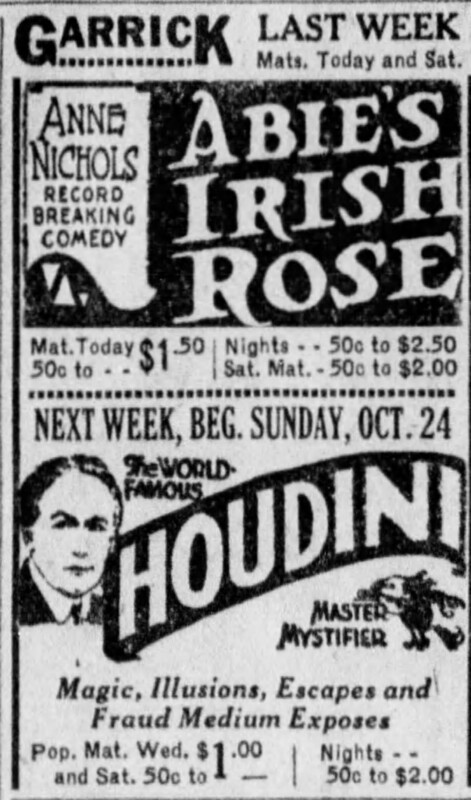 On October 22, 1926, Houdini was wrapping up a weeklong gig in Montreal. That morning (Friday) he met with some McGill University students backstage in his dressing room at the Princess Theatre to chat. One student, Joselyn Gordon Whitehead, asked Houdini if it was true that he could withstand any blow unharmed, while another student, a Mr. Smilovitch, sketched Houdini’s portrait. The first-year McGill student asked Houdini whether it was true that punches in the stomach did not hurt him. Houdini remarked rather unenthusiastically that his stomach could resist much, though he did not speak of it in superlative terms. Thereupon he gave Houdini some very hammer-like blows below the belt, first securing Houdini’s permission to strike him. Houdini was reclining at the time with his right side nearest Whitehead, and the said student was more or less bending over him. These blows fell on that part of the stomach to the right of the navel, and were struck on the side nearest to us, which was in fact Houdini’s right side; I do not remember exactly how many blows were struck. I am certain, however, of at least four very hard and severe body blows, because at the end of the second or third blow I verbally protested against this sudden onslaught on the part of this first-year student, using the words, “Hey there. You must be crazy, what are you doing?” or words to that effect, but Whitehead continued striking Houdini with all his strength. This account is contradictory to most of what I’d imagined of the famous blow. First, it describes Houdini lying down, which changes the dramatic renderings in illustrations and later movies. And second, it conjures a nasty image of a hotheaded, even vicious attack on a defenseless middle-aged man who just wants to rest up while chatting with some fans. Regardless of the pain, Houdini insisted on performing that night, despite a 104 degree temperature. He complained of severe pain on the train to Detroit. Bess, worried, insisted that they phone a physician to be on call in Detroit, but the train was running late and on the night of the 24th, they arrived in Detroit with just enough time to get to his scheduled performance at the Garrick Theatre. The doctor examined Houdini before his performance and diagnosed him with acute appendicitis and recommended immediate hospitalization. Houdini refused and insisted on performing; however, by the third act he was in major distress and his assistance completed his final tricks (he did not, by the way, collapse dramatically onstage). The ailing performer still refused to go to the hospital, until his New York physician convinced him he must. Houdini underwent emergency surgery at 3 pm on October 24 at Detroit’s Grace Hospital. A second surgery on the 28th did little to improve his condition; in the days before antibiotics, a ruptured bowel generally meant slow and painful death. As Houdini’s condition worsened, worried fans clogged the hallways of Grace Hospital, sometimes interfering with other patients’ care, until they were banned wholesale from the premises. Meanwhile, Houdini hung on gamely while theater critic Len G. Shaw wondered on October 30th “Just why Detroit should have been singled out for exploitation the country over as a hoodoo town for actors”. With this…dang it, we’re out of space. There’s so much more we’ll have to bust out yet another post. In Part 3, we’ll learn exactly what did (and what didn’t) kill Houdini. And most especially, we’ll investigate the enduring legacy of Houdini in Detroit, from Grace Hospital’s repeated seances to the WR Hamilton Funeral Home on Cass. 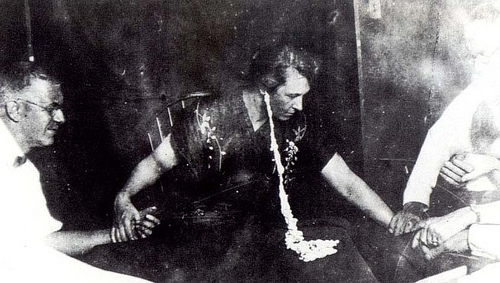 And we’ll dive down the rabbit hole of mystics and skeptics while we try to uncover whether Houdini did, after all, send a message from beyond to his beloved Bess.